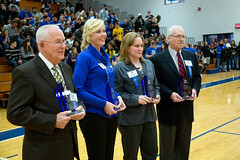 Aurora University recognized four Hall of Fame Inductees on Saturday, January 26, 2013 during its Hall of Fame Day celebration. 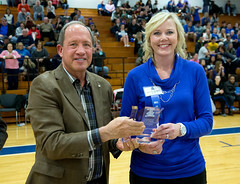 The AU Spartans Hall of Fame was established in 1988 to recognize athletic, personal and professional accomplishments of Aurora University graduates, coaches and athletic department staff members. 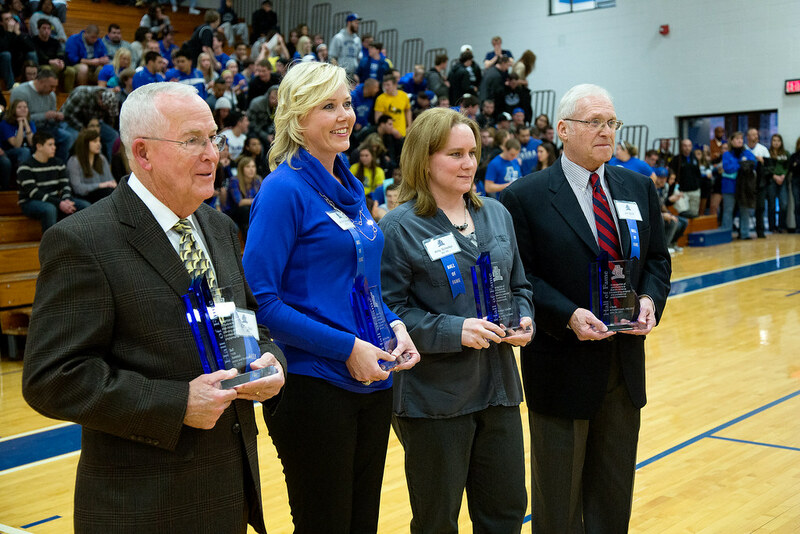 The Class of 2013 Hall of Fame Inductees included Charlie Bell, AU ’58, Jennifer (Gabel) Buckley, AU ’95, Amy (Periman) Scheller, AU ’94, and former Head Football Coach Jim Scott. 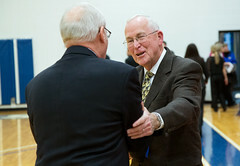 The induction ceremony took place during halftime of the men’s basketball game. Charlie Bell: Bell, a 1958 graduate of Aurora College, played football, basketball, baseball and cross country. He dedicated his career to teaching high school mathematics and coaching multiple sports. During his 50 year career in coaching, in the Fox Valley, Kentucky, Arizona and Washington State, he led 13 student-athletes to individual championships in track and field and was a part of two football state championships. He was also honored as Coach of the Week by the Arizona Cardinals and Coach of the Year by the State of Arizona. 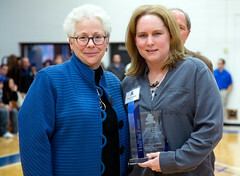 Jennifer (Gabel) Buckley: Buckley, a 1995 graduate of Aurora University, is currently the Director of the School of Health and Physical Education and Associate Professor of Physical Education at the university. As a student-athlete, she earned the honor of 1993 and 1995 NIIC Player of the Year and was a four-time NIIC All-Conference selection. She is the Spartans all-time leader in rebounds for a career with 1,136, rebounds in a season with 358 and in a game with 29, and holds the record for field goals made in a career with 624. She finished her four-year career averaging a double-double with 14.6 points and 10.7 rebounds per game. She went on to become AU’s Head Women’s Basketball Coach from 1999-2005. Buckley holds a doctorate from Northern Illinois University. Amy (Periman) Scheller: Scheller is a 1994 graduate of Aurora University, where she was an accomplished three-sport student-athlete in softball, tennis and basketball. 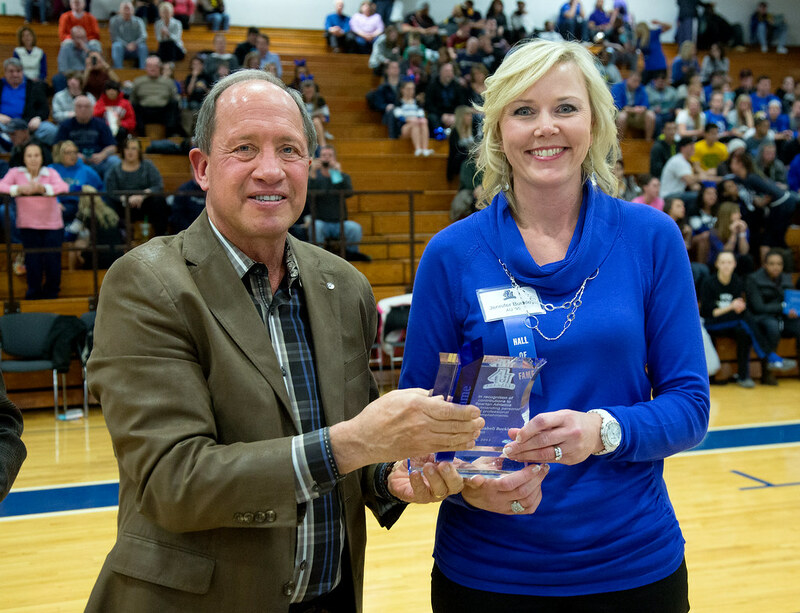 During her college career, she was recognized as an NCAA Division III Softball All-American in 1993 and still holds the AU record for slugging percentage in a season and career triples. A two-time NIIC All-Conference performer and 1994 NIIC Player of the Year, Scheller amassed a .416 batting average with 10 home runs, 35 triples, 31 doubles, 124 runs scored, 123 runs batted in and 61 stolen bases in her four-year career. In 2010, Scheller became the first female Lieutenant in Naperville’s Fire Department, and was awarded The Exchange Club of Naperville’s 2011-2012 Firefighter of the Year for her work. Jim Scott: Scott served as Aurora University Head Football Coach from 1986-2004 with an overall record of 102-69-3. When he began his career, the university had not fielded a football team for more than 30 years. He built the program into a top NCAA Division III competitor and led the 1992 team to the first NCAA playoff bid of any football program in Chicagoland. Prior to coming to AU, he coached high school football for 20 seasons and was elected to the Illinois High School Football Coaches Association Hall of Fame in 1987. In 2001, he was recognized as the Illini-Badger Conference Coach of the Year and in 2005 was honored with Aurora University’s Tony Olejnik Leadership Service Award. He continues to serve the university as a faculty member in mathematics.